The images here have been provided by Richard, a visitor to this website. 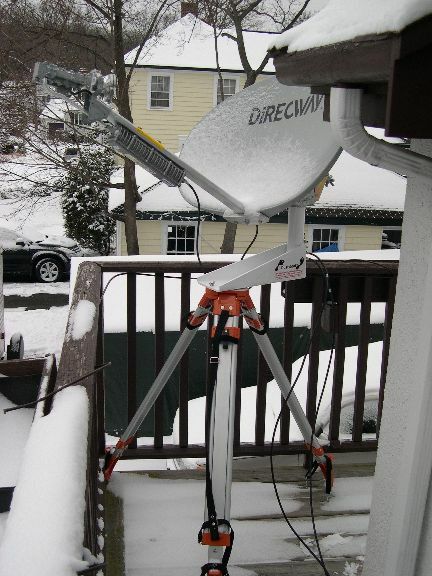 He has a HughesNet satellite internet dish mounted on a portable tripod. The image above shows the elliptical HughesNet dish mounted on the Dustyfoot bracket which is attached to a tripod. Note the tie down loops to prevent movement during wind. 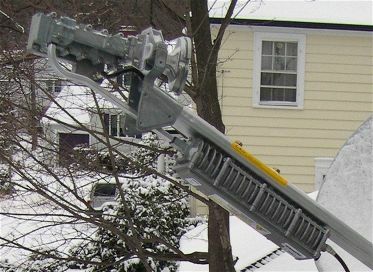 The image below shows the HughesNet feed arm and outdoor RF modules. These comprise the feed horn, the ortho-mode transducer (OMT) which separates the vertical and horizontal polarisations, the filter assembly which prevents spurious power from the transmitter overloading or destroying the LNB input low noise amplifier transistor. The LNB is not visible as it is behind the filter. There is a 14 GHz silver coloured waveguide coupling the output from the BUC to the filter assembly. The transmit BUC is attached under the feed arm. Two 75 ohm impedance coaxial cables are involved, one for the transmit signals and DC power to the BUC and one for the receive signals and DC power to the LNB. Richard's message was as follows: Eric, You asked for pictures on your site. Well, I just installed a HughesNet dish, using AMC-9 satellite. The picture shows my temporary set-up at home in the Boston area, trying it out before heading for Mexico with it. Signal strength is 70+, speed varies from down 700k to 1Mb, up 50k to 100+k. Not quite cable broadband quality but adequate for the traveller who has no alternative. Cheers and Thanks for your Site. Richard.